Epidemiologist uses Global Burden of Disease Study findings to pinpoint top causes of health loss in the Philippines, helping the archipelago move toward universal health coverage. 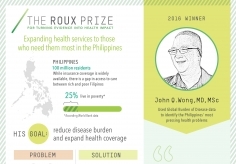 WASHINGTON – A Filipino epidemiologist and professor has been awarded $100,000 for using health data to identify the most taxing health problems in the Philippines, helping his country expand health coverage and reduce the costs involved. The award is part of the annual Roux Prize offered by the Institute for Health Metrics and Evaluation (IHME), an independent global health research organization at the University of Washington in Seattle. 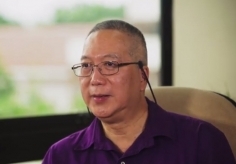 The recipient, Dr. John Wong, also identified and recommended specific, cost-effective interventions for Filipinos, including blood pressure measurement, breast examination, risk profiling for hypertension and diabetes, and smoking cessation. Although the Philippines began rolling out universal health coverage in 2010, nearly 8 million Filipinos still lack health insurance. Those who are covered still pay 60% of their health expenses out-of-pocket. As a result, many poor families cannot afford critical services. Under the new expanded benefits plan, patients will have to pay little or nothing. UNICEF approached Dr. Wong to develop a new, evidence-driven process to be used by the Philippine Health Insurance Corporation (PhilHealth), the managing agency for the National Health Insurance Program, for selecting services to be included in the country’s universal health plan. Looking to the disability-adjusted life year (DALY), the cornerstone metric for the Global Burden of Disease Study (GBD), Dr. Wong and his team identified the top 48 causes contributing to 80% of all health problems in the Philippines. This list is now the core of the new prioritization process driving the new health package that aims to cover 15 million Filipinos with the most need – the poor. In 2013, the top causes of health burden in the Philippines were heart disease, respiratory infections, tuberculosis, preterm birth complications, diabetes, stroke, low back pain, and iron-deficiency anemia. Since the adoption of the new priority-setting procedure, two individual health plans focusing on maternal health and children with disabilities have been approved for the new guaranteed health benefits program. The Roux Prize is presented annually by IHME, and is named for the founder of the award, David Roux and Barbara Roux. David Roux is one of IHME’s original board members and has been a longtime champion of using better evidence to improve decision-making in priority-setting and resource allocation. Dr. Wong, a collaborator in the Global Burden of Disease Study since 2013, has over 30 years of experience in epidemiology, biostatistics, community health, program management and evaluation, and health system management. The Roux Prize is intended for anyone who has applied health data and evidence in innovative ways to improve population health. Nominees may come from anywhere in the world and could include, but are not limited to, staff in government agencies, researchers at academic institutions, volunteers in charitable organizations, or health providers working in the community.